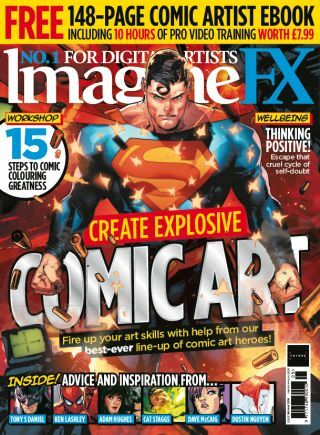 Learn how to create eye-popping comic art in the latest issue of ImagineFX magazine - on sale today. Inside issue 160 you'll hear from some of the biggest artists in the comics industry about how they got to where they are today. Perhaps their words of wisdom will help you on your own path to artistic greatness? Buy issue 160 of ImagineFX here! Besides all the news, reviews and amazing art from readers that you've come to expect from ImagineFX, there's an added treat this issue as we're giving away a free 148-page Comic Artist ebook worth £7.99. With over 10 hours of professional videos packed into its digital pages, you won't want to miss it. Take a look at this issue's headline features below. Famous for his loose and spontaneous art style, Tony S Daniel has become regarded as one of the greats of the Batman illustrators, up there with the likes of Frank Miller and Neal Adams. We talk to the artist about how he learnt from the best and how he balances art and writing. Colour is one of the more creative ways comic artists can tell their story through their illustrations. As well as establishing the tone of a story, colour can flesh out character details and set the pace of the action. Award-winning artist Dave McCaig shows you how to add extra layers to your story with these colour tips. Drawing a comic character's facial expressions is a tricky balancing act. On the one hand each one has their own distinctive look, while on the other there are certain anatomical rules to keep in mind. Neil Edwards shows you how to make the most of both to create emotional characters in this workshop. When it comes to creating a piece of comic cover art, artist Dustin Nguyen believes the medium should compliment the finished piece. In his workshop, Dustin shares how to create an emotional comic scene using the sensitive medium of watercolours. It's a sad fact of the industry that plenty of artists are plagued by self-doubt. In this feature leading artists share how they cope with negative thoughts and combat the dreaded imposter syndrome. Buy issue 160 of ImagineFX now!